On Saturday, February 6, a small group of young men and the Servant Brothers from the Home of the Mother left from Villalbilla, Alcalá de Henares (Spain), on a pilgrimage to Fatima, Portugal. Along the way, we stopped at the monastery of the Palancar in the Extremadura. Within the large monastery there is a smaller monastery that was built by St. Peter of Alcantara where he spent two years. To see the austerity with which the Franciscan monks of the reform had lived previously in that place, was a great example that helped us bear and offer up the small inconveniences that arose in our pilgrimage. 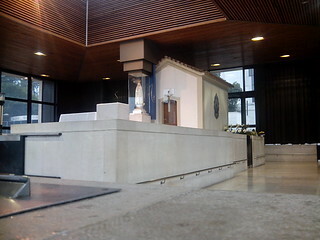 We arrived in Fatima on Saturday afternoon, and the first thing we did was to go to the 'Capelinha' (place of the apparitions of Our Lady to the 3 little shepherds) to pray to Our Mother and to ask her to help us to open our hearts to the graces that she wanted to grant us. Then we visited different parts of the shrine, and in the evening, at the end of the Rosary, 4 young people from our group had the grace of bringing Our Lady in procession throughout the sanctuary. There was no better way of beginning our stay in Fatima. The next day, Sunday, we started the day with a great blessing: We were able to celebrate mass in the 'Capelinha' for our group. Later we went to visit the House of the little shepherds in Aljustrel and prayed the Stations of the Cross on the way to the place of the apparitions of the Angel. It was there that Father José Luis providentially met a young man who used to go to the camps of the Home of the Mother when he was young, and he invited us to a vigil organized by the group J.R.C (young people for the Kingdom of Christ). Our pilgrimage coincided with theirs and they were celebrating their 25th anniversary of their pilgrimages to Fatima. For that reason they were allowed to expose the Blessed Sacrament at the vigil that they held at night in the 'Capelinha'. It was attended by more than 500 young people from all parts of Spain. It was a very nice experience. There were songs, exposition of the Blessed Sacrament, points of meditation and moments of silence for personal reflection. They spoke of the three gifts that God makes to us: Our Mother, Her Heart and the Cross. In the morning of Monday February 7, we went to Santarem to visit the Eucharistic miracle that is there in the Church of St. Steven. The blood of a consecrated Host which bled in the 13th century is preserved in a glass cup. We had the grace of venerating the Holy miracle individually and then had time for adoration with songs in front of the exposed relic. In the afternoon we paid a visit to the Cenacolo community. We had a very nice time there, we prayed the Rosary with them, we celebrated Mass and they shared a few testimonies of conversion that showed the power of God's grace in a very clear way. On the last day, on Tuesday, we again celebrated mass in the 'Capelinha' for our group before heading back to Spain. The atmosphere within the group was great: familial, prayerful, in a spirit of conversion. These have been a few precious days, full of spiritual graces for all of us. We have felt the presence of Our Mother in a very strong way and hopefully all these graces will continue to give fruit and unite us more and more to the Virgin Mary.